WHY CURRICULUM NEED A CHANGE. We know that Education is an on-going process. Hence it is only logical that nations are always researching and introducing changes into existing education systems in terms of structure and curriculum. Changes in curriculum are geared towards improvement, particularly in relation to the quality of the teaching and the learning process. Curriculum has implications for teacher competence and capacity to manage change because most curriculum change involves innovations. Curriculum Change, Change is not an automatic process. Even in managing and developing a centrally prescribed curriculum at the school level adaptation is an important aspect to be considered. 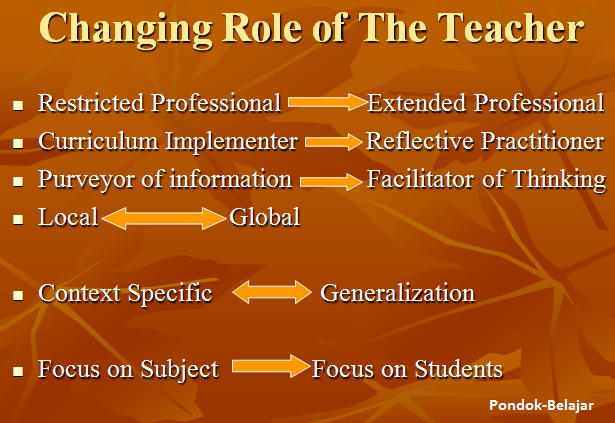 Adaptation here means adjusting, translating curriculum into classroom processes of teaching and learning. This includes taking into consideration local factors such as, the level of students’ competence, level of the support system and the educational infrastructure and facilities available. Curriculum change is a challenge and many a curriculum change has failed because of the inability of the teachers to understand the change and the implications of that change for their role as teachers. Change in curriculum is normally introduced to meet new local needs or global demand. Change in curriculum can be in the form of reforms or innovations and it involves the use of appropriate change models and strategies. The choice of appropriate change models strategies is of great impotence if we want the change to happen and become sustainable. If consideration is not given to this crucial aspect, reforms and innovations will not bring the intended change. At the level of class room, it is what teachers believe and what teachers do that determines the nature and quality of learning that is experienced and acquired by their students (Hargreaves:1994). Hence there is a need for the teachers to have a clear understanding of the curriculum change and the ability to bring about the change. Because we know that the Curriculum includes not only contents, and pedagogies but assessment. Curriculum management is a process of translating, interpreting the written curriculum into classroom process that enable effective learning. Glatthorn et al (2009), state that curriculum is the plan made for the guide line of learning, in the schools, and it usually represented in retrievable documents of the several levels of majority, and the actualization of those plans in classroom, as experienced by learners and recorded by an observer; those experiences take place in a learning environment which also influence what is learned (p.4). According to Tyler; curriculum is a plan for action or the written of the document that includes strategies in order to achieve desired goals (Ornstein and Hunkins, 2009). In my view, the curriculum as a plan of studies includes all aspects of learning processes, such as objectives, methods and organizing, the learning environment, evaluation which pertains to content, pedagogy (teaching and learning) and assessment. Curriculum as vehicle for education, is supposed to be easily understood by teachers who will implement the curriculum at the school level, by engaging his/her students in a process of active and meaningful learning. Hence, curriculum is assumed to be a vital tool in the education process. 1.Allan C. Ornstein France P. 2004. Curriculum foundation and principle. University of Washington, emeritus. 2.Griffiths, Carol. 2008. Lessons from Good Language Learners. Cambridge. 3.Kenneth T Henson, 2001. Curriculum Planning. Publish by McGraw-Hill, an imprint of the McGraw-Hill Companies, inc. New York. 5.Hasan Sadly. Kamus Bahasa Inggeris-Indonesia. PT Gramadia Pustaka Utama Jakarta. 6.A.V. Kelly (1999), The curriculum theory and practice. Paul Chapamn Publising Company, 6 Bonhill Street London-England.